Whether you're looking for a simple rental for a wedding, childs birthday, baby shower, or elaborate themed gathering, starting off with our Party Packages is definitley the way to go. They eliminate the hassle of figuring out the basics that you'll need and also let you add on additional items at a discounted rate vs a la carte prices. Any package can be tailored to your party size (larger or smaller). Need addtional tables or chairs....no problem. Also adding on essentials like a tent or canopy or food machine will give your event just that extra ooh la la. Please contact us today for more info and we'll create a package just for you. Pricing all inclusive of rental equipment, theme decor, Set up and Breakdown! - Set up and Breakdown INCLUDED! 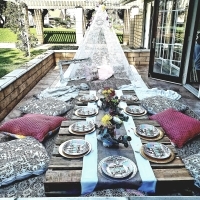 *add greenery, colored fabrics, twinkle lights, etc. 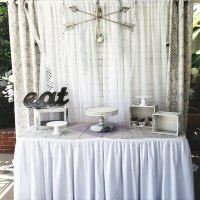 *add theme decor, photobooth props, colored fabrics, twinkle lights, etc. Let us help you throw a party your guests will never forget, because we know execution can be daunting. Brainstorming, researching and sourcing take time, life is busy, and sometimes, it just feels as if there are never enough hours in the day. Maybe you know what you like, but don't know how to pull it all together. That's where we step in to provide our expertise, creativity and energy for whatever your project may be.